Last Saturday I had the pleasure of putting on a small Infinity tournament as part of Vanguard's annual Spoils of War event. Traditionally this has been purely a 40k weekend but due to slightly lacklustre ticket sales they had some tables and scenery going spare and were offering space to other gaming systems that wanted to run things along side it. I couldn't turn down an offer like that now could I? So, with less than a month of prep and organising I sorted out scenery, prizes and a dozen players for the first annual Spoils of War Infinity tournament. I'm happy to say that it all went rather well. It was my birthday not too long ago, and after almost six years I've finally convinced my girlfriend that small toy soldiers make for ideal presents. I'm really quite impressed by the amount of research she did into getting hold of some nice old lead for my burgeoning Chaos forces, including excursions onto the CCM Wiki and Stuff of Legends!. So without further ado, meet the new recruits. 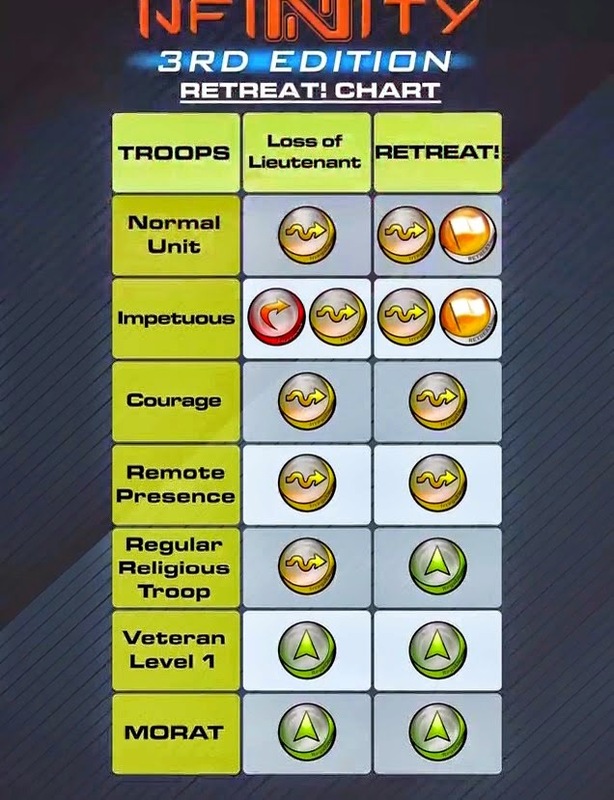 Infinity - Loss of Lieutenant and Retreat changes. 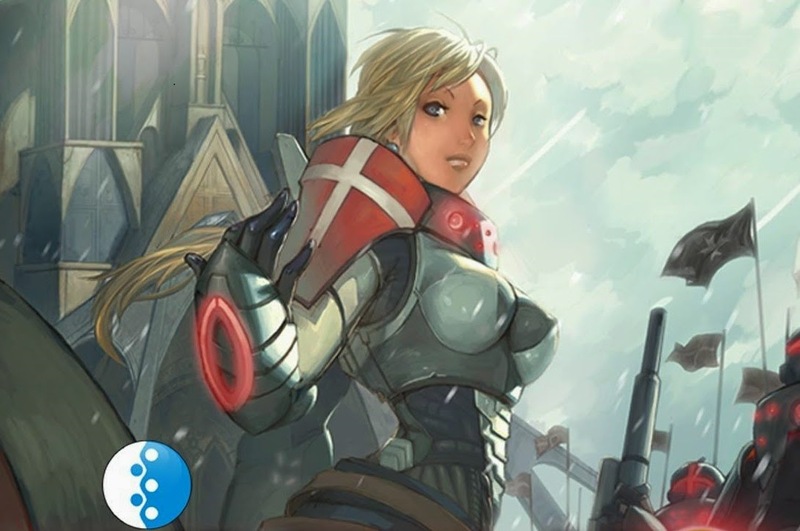 Over at Bell of Lost Souls there is an article about some of the recent N3 announcements that I feel it's worth talking about a bit more. 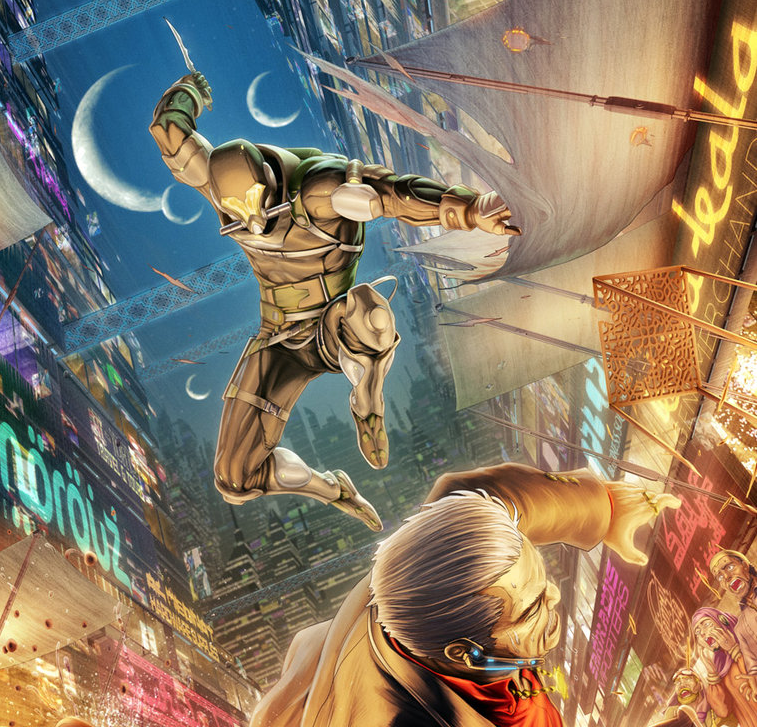 Two of the harshest parts of Infinity currently are the Loss of Lieutenant rules and the Retreat rules. Both of them are effectively crippling for an army, but that's all changing now. Just take a look at the chart below. This time I'll be looking at Haqqislam's suite of Impersonators and how to make them as unpleasant for your opponent as possible. I'm sure that many of you have heard of the Saladin, Fiday and Al-Djabel list before, it is fairly notorious after all, and I'll be using those models as the core of this list. The idea is that with Saladins WP of 17 you are more likely to take the first turn and using Strategos you will also be able to deploy more favourably. Strategos allows you to keep two models in reserve (your Impersonators, ideally) and your opponent may not keep a reserve model at all. As an added bonus you may spend your Lieutenants order on whoever you like which makes your army just that little bit more efficient. So, with this in mind, let's see what we can do. I recently had the pleasure of attending Blast-Tastic! (yes, the exclamation mark is compulsory), a small sci-fi specific wargaming show in Bristol, for it's very first event. Considering it was an entirely new venture I have to say it was very smoothly run by Michael of Angel Barracks. I signed up to run demonstration games of Infinity throughout the day using scenery kindly provided by Ian from The Wargaming Trader. The show itself was a success, although I did bemoan the lack of a bring-and-buy which is normally a great draw for me, and I even picked up some new bits of scenery to take back to my local club. I'm trying out something new for the blog, a bit of an experiment I guess as I have no idea if this is something that people would be interested in. Each week (or two, or three...) I'll cook up an interesting looking list and talk about it in the context of the current ITS system. Sometimes it'll be pure theory-crafting, sometimes it'll come with a battle report, either way I hope that these lists will cause some discussion. This first list spawned in a car journey on the way back from a tournament in Exeter when Robin (i0003), Matt (Drastic), Stuart (Fathi Amirmoez) and I were plotting lists for an upcoming tournament. Frankly it's just too much fun not to share. In addition to all the seminars happening last weekend there was also an 8-man ITS tournament on the Sunday run by Paul Quinn. Never one to pass up the opportunity to play against some new faces I signed up. It was an unusual format - 200pts with a Spec Ops - and the missions were Supplies, Frontline and Annihilation. 200pts is normally a very restrictive format as it can be difficult to get a good mix of specialists and decent attacking units whilst retaining a full order pool, but using a Spec Ops frees up your points significantly as it provides cheap Chain of Command, heavy weaponry or hacker/doctor/engineer support as necessary. 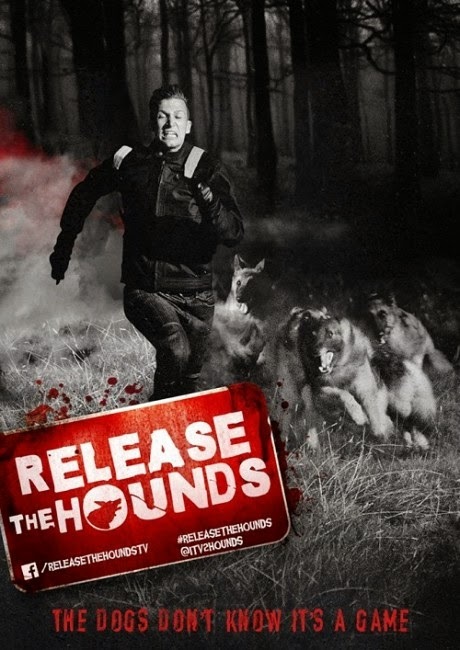 As a complete aside, we ended up watching Celebrity Juice and Release the Hounds on the Saturday night. When did TV get weird? Apparently this is a thing. Would be better with Antipodes though. 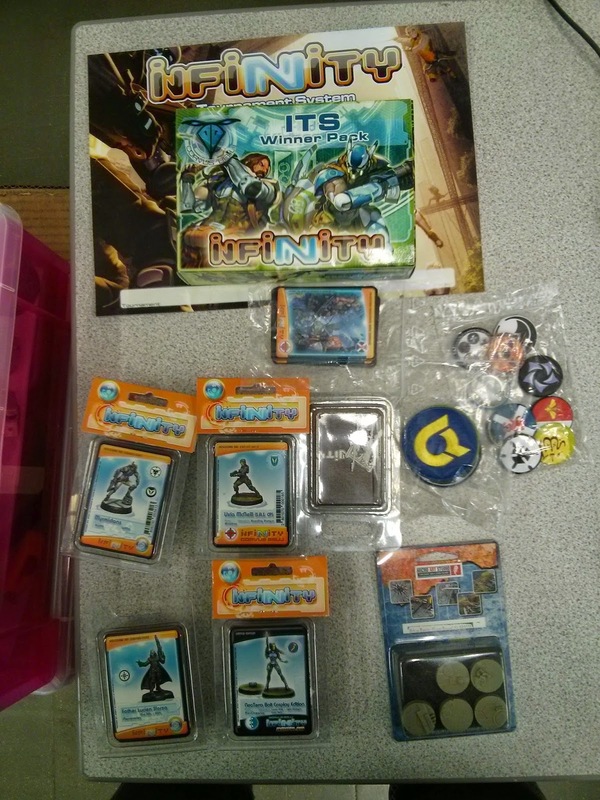 Last weekend (27th-28th September) was the Infinity event at Tabletop Nation hosted by Wayland Games and attended by Carlos (Bostria to some of you) from Corvus Belli. They were two fun filled days and included a couple of Seminars where lots of juicy information was revealed, an ITS tournament (report coming soon to a blog near you) and lots of demo games. Of these I'm sure you are all most interested in the gossip. Some of this might commonly be known by now, especially by those following the news closely, but hopefully there will be a few gems in here.